The fourth quarter of 2018 was a tumultuous one, with virtually every asset class taking it on the chin. While interest rates took a lot of the blame for weak performance domestically, the narrative internationally was about trade wars, Brexit, and debt problems in Italy. The MSCI EAFE Index (the “Index”) declined 12.54% in the quarter, compared to the Intrepid International Fund’s (the “Fund”) decline of 12.13%. Smaller companies, which currently make up the bulk of the Fund, performed worse, with a fall of 16.05%, as measured by the MSCI EAFE Small Cap Index. While we slightly outperformed the Index in the quarter, this was not the result we had hoped for. In the early part of the calendar year, the Fund suffered due to a few bad calls, but we don’t feel like this was the case for the fourth quarter. Instead, in many cases there was positive fundamental news that did not coincide with positive developments in the stock price. Everything suffered, fundamentals be damned. We will review some of these positions below. We took advantage of the market’s decline, and the Fund is now more invested than it has been at any time in its history. The securities that were the largest detractors in the fourth quarter include Coventry Group (ticker: CYG AU), Hornbach Baumarkt (ticker: HBM GR), and Net 1 UEPS Technologies (ticker: UEPS). 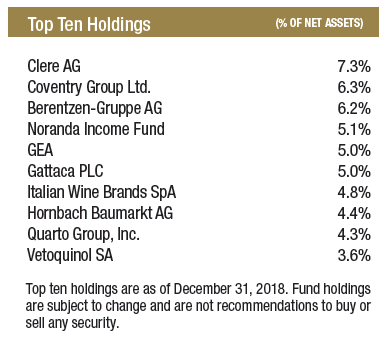 Most securities in the Fund were detractors, but there were a few positive contributors, including Noranda Income Fund (ticker: NIF-U CN), Corus Group (ticker: CJR/B CN), and Aegean Airlines (ticker: AEGN GA). Coventry Group is an Australian supplier of fasteners. The share performance has been unjustifiably weak in our opinion. On October 5th the company raised AUD $15 million via an equity offering at AUD $1.15 per share. Fast forward three months, and at the end of the year these shares were priced at an AUD 73 cents in the Fund. Over those few months, there has been no real news and trading in the shares has been thin, with only about AUD $300,000 being traded, or about 2% of what was raised in October. On October 4th, one day before the equity offering was listed, Coventry’s shares traded at A$1.245 per share, resulting in a market cap of A$47 million. Even after the A$15 million raised, the current market cap is now only A$37 million. If we remove the A$15 million raised, the underlying market cap of the existing business is only A$22 million. The liquid assets on the balance sheet alone more than support this value. As of the most recent reporting period, Coventry had A$82 million in current assets and A$38 million in total liabilities. Current assets minus total liabilities was A$44 million, or about twice the underlying market cap. These current assets consist entirely of receivables, inventory, and cash. To us, this is completely irrational. This is a company that increased revenue 9% in its most recent reporting period, and as of their most recent announcement this momentum has continued. The business is on track to be profitable in 2019. The equity raise is not a concern to us, either. Just over A$10 million of the proceeds were used to purchase a similar business that caters to a different client base. At 4x EBIT, the acquisition price could hardly be considered high, and the new business diversifies Coventry’s customer base to less cyclical end markets such as agriculture and defense. To recap, the company has been growing, news has been positive, investors were willing to supply them with additional capital, yet the share price declined significantly on little volume. Hornbach Baumarkt is a German DIY retailer that reported weak earnings during the quarter. The weakness was due to increased procurement costs, primarily in building materials, that they were not able to pass on to customers. While this was a negative, we believe Hornbach and its competitors will eventually raise prices to offset the weakness. Furthermore, the company has been growing; comparable store sales in the most recent quarter increased over 6%. While the quarter’s results were likely responsible for the near-term weakness in the stock price, we believe the shares are trading at a cheap price relative to their intrinsic value. We don’t typically value businesses based on price-to-book value, and especially not retailers due to the hidden liability of operating leases. However, Hornbach owns a great deal of their real estate, and most of the leases they do have are with their parent company Hornbach Holdings, which we believe would be a friendly negotiator in the unlikely event the company was not able to pay rent. 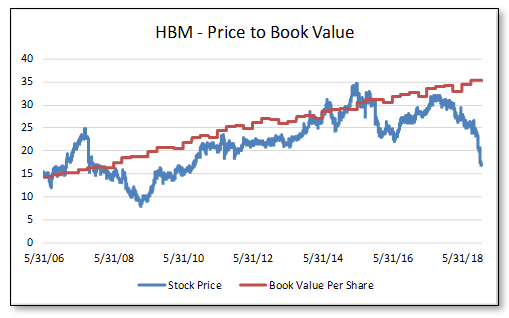 Price to book value can thus provide some insight into how cheaply the shares are trading relative to where they have traded historically. The stock currently trades at about half of book value, the lowest multiple since 2009. Furthermore, the company has grown adjusted book value by 13.5% annually since 2006. We believe one reason for the weakness in the stock price is that Hornbach has invested heavily into its digital offering, with much of this investment flowing through the income statement in the form of higher costs. These costs reduce book value, even though they are likely adding economic value in the long run. Each year as the company has grown, it has reinvested more and more of the profits, making reported earnings appear flat. The company now has the largest digital market share of the DIY market in Germany. We believe management’s online investment is a sound strategy, but it has not yet shown up in the fundamentals. Management has recently discussed reviewing digital costs, and we believe any flattening or reduction in spending will filter directly to the bottom line. As we have discussed in previous letters, our thesis on UEPS is that the company would thrive after ending its embattled contract with the South African Social Security Agency (SASSA). We believed the market did not recognize UEPS’ earnings power outside of this large contract and that the company was trading at a low single-digit multiple of its prospective earnings. We also believed the market was not giving the company credit for its balance sheet investments, which the company has poured more cash into over the past few years than its current market cap. In November, the company reported 1st quarter earnings that drove the stock down precipitously. As expected, the contract with SASSA was successfully terminated at the end of September, but the losses from the legacy cost structure of the SASSA contract ate into profitability more than expected and spooked investors. These losses were exacerbated by an ongoing legal dispute with the government over how much UEPS should be paid for the final contract extension. UEPS also reported that the EasyPay Everywhere (EPE) service offering was losing members at an alarming rate, primarily because SASSA had illegally force migrated grant recipients off the platform. All of this led UEPS to revise its guidance down. Despite the 1st quarter hiccup that drove the stock down, we are still bullish on UEPS. We knew that the transition away from the SASSA contract would be messy, but a few recent announcements have us hopeful the company has turned a corner. First, the government ruled that the grant recipients who had been force migrated off the EPE platform by SASSA should be reinstated. This means EPE will have most of the lost members brought back in January. Additionally, the Constitutional Court in South Africa ruled that SASSA and UEPS should engage directly to finalize remuneration related to the contract extension. This reimbursement should help offset the operating losses incurred by the UEPS subsidiary that handled grant payments in the 1st quarter. Lastly, the company’s South Korean payment processing business, KSNET, as well as several of UEPS’ balance sheet investments, continue to perform well. Combined with a core South African business that is now unencumbered by the SASSA drama, we believe UEPS has troughed, will continue to generate free cash flow, and is primed for growth. Noranda Income Fund is a Canadian zinc smelter that is well positioned to take advantage of a change in pricing dynamics in the industry. For the current year, we estimate the company gets paid a locked-in treatment charge of somewhere between $40 and $50 per ton of concentrate processed. Recent treatment charges have been some of the lowest in history. Noranda is currently in talks to negotiate its price for the upcoming year, and market prices are more than double the current contracted price. While the final negotiated price will likely be lower than the current market price, we believe it will be materially higher than what they were paid this year. The shares increased nearly 11% in the quarter in local currency, but at a closing price at December 31st of CAD $1.30, we believe they are still significantly undervalued. The net assets of the company were C$4.75 per share as of the most recent quarter, including land with a market value that is likely substantially higher than its accounting value on the books. Corus Entertainment is a Canadian media company with top-tier content in both the Children’s and Women’s markets. There was nothing especially promising about the business in the quarter; rather, we believe the shares have been taking it on the chin so long that there were simply no sellers left. Aegean Airlines S.A. (ticker: AEGN SA) is a Greek regional airline. The descriptor “Greek airline” alone is probably enough to turn most investors off, but we would urge our readers not to judge this book by its cover. After acquiring its main competitor in 2013, the company has a dominant share of the domestic market. Despite the well-publicized economic challenges facing Greece, the company has managed to deliver good results by expanding the number of international routes it operates. And while many Greek businesses have struggled, the tourism industry has been a rare bright spot. International passenger traffic to Greece has been very strong, and we think it’s likely this can continue. In addition, we have observed the airline industry become much more rational with respect to capacity allocation in recent years. For decades, airlines expanded capacity in good times, leading to supply gluts and a notorious boom-and-bust industry dynamic. However, management teams today appear to be much more disciplined and focused on returns on capital. Over a third of the stock is held by Chairman Eftichios Vassilakis, who also appears to manage day-to-day operations. The airline has performed well under his leadership, and we are happy to have his interests aligned with ours. Perhaps most importantly, the price of the stock is very cheap. The P/E is less than 8x, but a pile of cash on the balance sheet has led to an EV/EBIT less than 2x. We think the small gains since our purchase can be explained by a solid tourism season announced in the Q3 earnings report, as well as the recent decline in oil prices. While not a top contributor or detractor, another interesting stock in the Fund is Berentzen-Gruppe (ticker: BEZ GR). The company is a German beverage producer, selling both alcoholic and non-alcoholic drinks. During the fourth quarter the company reported a 4.4% increase in revenue and a 68% increase in operating earnings. The stock fell nearly 10% for the period. We point Berentzen out as a company that we believe has a stable top line, improving earnings, and cheap valuation, yet the stock price still fell. We purchased more of this security during the quarter. Over the last several years, we have argued that market participants have bid up prices to a risky level, especially in larger companies. As markets have declined, we think there are “opportunities for exceptional returns.” However, we are still finding them primarily in smaller companies. In fact, the largest decile in the Index, as measured by market cap, outperformed every other decile by a minimum of 2% in the fourth quarter. Using that definition, I would say that I am optimistic about many smaller international companies, especially the ones in the Fund. As some of our existing holdings have fallen, we have taken the opportunity to purchase more shares – in some cases, aggressively so. As of December 31, 2018, cash and equivalents represented about 12% of the Fund’s assets. This is the lowest cash has been in the history of the Fund, which is due to our belief that there are more undervalued stocks in the market than there have been since the inception of the Fund. This is how we express our…optimism. Markets could fall a great deal farther. Some of our stocks may fall as well. We will likely take this opportunity to make additional purchases. For the most part, we don’t believe the fundamentals of our existing holdings have deteriorated. In some cases, we are fairly certain of this. Prices are low, and our conviction level is high. While the past year has been a bumpy ride with prices, as long-term investors in businesses we’re happier than we’ve been in a long time. The MSCI EAFE Net Index is recognized as the pre-eminent benchmark in the United States to measure international equity performance. The MSCI EAFE Hedged Index represents a close estimation of the performance that can be achieved by hedging the currency exposures of its parent index, the MSCI EAFE Index, to the USD, the "home" currency for the hedged index. The index is 100% hedged to the USD by selling each foreign currency forward at the one-month Forward weight. The S&P 500 Index is a broad based, unmanaged index of 500 stocks, which is widely recognized as representative of the U.S. equity market in general. You cannot invest directly in an index. Yield is the income return on an investment. It refers to the interest or dividends received from a security and is usually expressed annually as a percentage based on the investment’s cost, its current market value or its face value. Cash Flow measures the cash generating capability of a company by adding non-cash charges and interest to pretax income. Free Cash Flow measures the cash generating capability of a company by subtracting capital expenditures from cash flow from operations. EBIT refers to Earnings before Interest and Taxes. Basis Points (bps) is a unit that is equal to 1/100th of 1% and is used to denote the change in a financial instrument. EV/EBIT equals the company’s Enterprise Value (EV) divided by Earnings Before Interest and Taxes (EBIT). Book Value is the value of a security or asset as entered in a company’s books. Price to Book Value is calculated dividing a company’s book value by its share price. Price-to-Earnings (P/E) Ratio is calculated by dividing the current price of the stock by the company’s trailing 12 months’ earnings per share.